Microsoft has published what can only be described as a privacy manifesto. 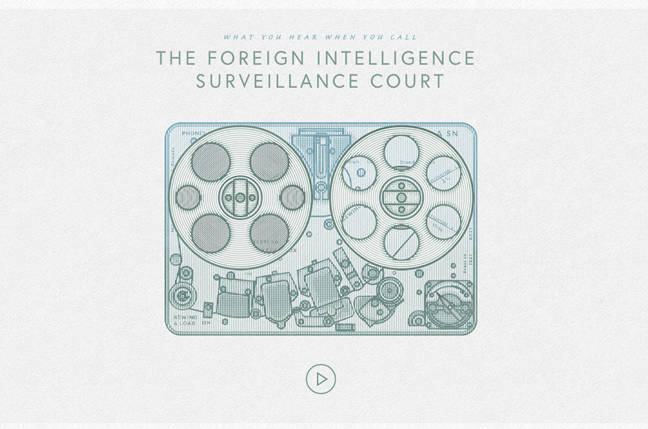 The unusual online screed comes complete with interactive graphics, including a recording of the FISA court's voicemail, and appears geared at pitching Microsoft as the protector of people's global data. Written by president and chief legal officer Brad Smith in a novelistic first-person style and designed to come across as authoritative and inspiring, the basic message is that the internet has made the transfer and storage of data a global event, but one subject to a wide array of complex laws. Microsoft stars as the hero of this self-created movie moment, at one point handing over emails by the Charlie Hebdo shooters in Paris before standing up to Brazilian authorities over Skype recordings and then suing the US government to protect its customers' data. In between, it screens The Interview in defiance of North Korean hackers. But before we have a chance to ask this philosopher king the obvious question, it has already asked itself. "We all realize that while we're living in a world where the Internet is bringing us closer together, borders here on Earth still matter. Personal and business security matters. National security matters. There is no national security without cybersecurity. That helps explain why so many governments are taking action. Fundamentally this calls on all of us to ask ourselves one overarching question: What's to be done?" The answer goes on a bit about values and North Stars but fundamentally the answer is: use Microsoft's cloud services. "We stand behind our technology with contracts to ensure we have strong and specific security safeguards. We process customers' information only as they instruct us, and we put in place strong regulatory compliance to meet their needs. We will tell them, whenever we're permitted, what the government is doing to access their data, and if we need to we'll go to court to vindicate those rights when that's the proper thing to do. Finally, we will continue to advance transparency." It's about the future of business and Microsoft's close relationship with the US government. As has happened many times in the past decade, Microsoft has been playing catch-up, blinded by its own history and past successes. It has lost out in mobile phones, even when it used its huge wealth to buy the best phone maker on the planet; it lost out on tablets, even though it has been working on them probably longer than anyone else; it is even losing ground in its core market: operating systems and office software. But most recently, one of its greatest assets – its close working relationship with the US government – has also counted against it. Google and Apple have stood up to the government following the Snowden revelations; Microsoft is seen as being far too cozy with the security services. Clearly the executive team at Redmond has realized that if it loses the global trust of users, it has nowhere to go but down. And so it has decided the company needs to get out ahead of things. From best friend of the US government to sturdy defender of customers' rights in one fell swoop. So this week we have had CEO Satya Nadella talking about the new data centers it is opening up outside the United States and the business relationship it shares with the UK's Ministry of Defense. We have Brad Smith popping up offering solutions to the Safe Harbor framework collapse, and we have numerous mentions and press releases highlighting the proactive role that Microsoft is playing in protecting your data. Now, we have the slick pitch. Far more reminiscent of the crowd-pleasing Apple or the philosophical intellect of Google than coming from grumpy old Microsoft, it is a funny beast. Lofty yet never quite taking off; aspirational more than inspirational; self-conscious and shiny like a recent divorcee heading to a bar in a new silk shirt.